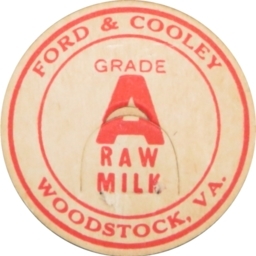 This picture shows a paper milk-bottle cap produced by Woodstock Virginia’s Ford-Cooley Dairy. The dairy was located just south of Woodstock near Narrow Passage. It operated from sometime in the 1930s until around 1960.